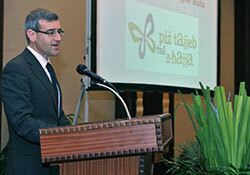 On 22 February 2012, the Superintendence for Public Health, in the Ministry for Health, the Elderly and Community Care of Malta, launched the Healthy Weight for Life strategy for 2012–2020. The Minister, Dr Joseph Cassar, said that the Strategy recommends a significantly stepped-up and coordinated multisectoral approach to tackle the trend towards increasing obesity and overweight in the Maltese population. The aim is a society in which healthy lifestyles related to diet and physical activity become the norm and healthy choices are easy and accessible to all, so as to prevent disease and prolong disability-free years of life. The strategy aims to halt and reverse the obesity epidemic through stepped-up intersectoral action. It suggests using both economic instruments to motivate healthy lifestyle choices – such as policies on pricing, taxing and subsidizing food, and employer tax incentives – and initiatives aimed at individuals, communities, schools, workplaces and specific health-sector services. Malta has some of the highest levels of overweight and obesity in the WHO European Region: 72% of men and 53% of women are overweight or obese, according to self-reported data provided to WHO. WHO’s European childhood obesity surveillance found that one in every three school-aged children is already overweight or obese.